As you know, West Papua Media has suspended publishing on our main site for a while now, due to a difficult ethical decision around the unsustainable safety costs for our clandestine journalists, that we faced without little support. In the meantime, key personnel have been working on the Project FiveArm Secure Crisis Journalism Tool, and also working on key safety measures, and will be continuing this work for at least several months into the new year. Sadly, we do have to warn: Any organisation or individual that attempts to squat our identity will be severely dealt with. Please do not underestimate our desire to protect this ten year project’s legacy and platform that will return as a critical platform for West Papuan voices. 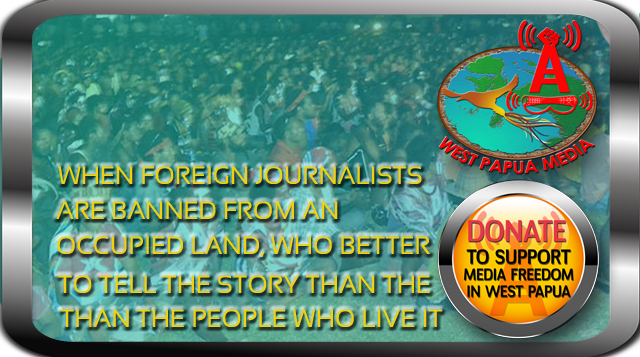 West Papua Media will be returning as a Witness Journalism and Human Security Monitoring initiate that will provide a robust global platform for independent and credible West Papuan voices to document their resistance and survival under Indonesian colonial occupation. It will become valuable a resource for both safe witness journalism skillsharing, and also for activist networks to utilise robust and provable high quality and factual evidence (of an international legal standard) from the field to assist in their campaigning, subject to correct attribution. When we return, we will be upgrading to a much safer, inclusive anti-surveillance platform, that will also enable safer and much more robust engagement with witness human rights and environmental journalists and readers, and utilise protected, encrypted and anonymous submissions of evidence of human security abuses. This will be funded through a significant crowdfunding effort and philanthropic requests. We will continue to be non-factional and non-partisan, inasmuch as we are embedded in the indigenous genuine self-determination aspirations of the West Papuan People, and the advocacy of Universal and basic Human Rights. We will continue to have the most robust and ethical Source Protection Policy in journalism today, and introduce innovative Safe Witness Journalism technologies and training resources, including encryption resources and manuals. WestPapuaMedia will also continue to work with indigenous media outlets and seek to renegotiate partnerships with clandestine and open journalists, outlets, sources and investigators who have met our Editorial Standards, using an exclusive blockchain source credibility scoring mechanism we have developed called ReputaChain. With reader support a fund for Assistance and training will be given to those who have yet to meet those standards and wish to be involved. West Papua Media will aim to begin work to create this new presence in February 2019. We look forward to returning to our mission of Helping the Voiceless Roar, louder and stronger than ever. But in short, we cannot publish because we cannot ethically provide our crew on the ground with the support needed to keep them safe and in contingency should they come under threat. WestPapuaMedia also simply does not currently have the personnel free at the moment due to critical background journalism support work we are doing. Editorial roles for continued publication of our partner content over the next few months, cooperation with livemonitoring teams for major mobilisations leading up to December 1, as well as a few basic articles of major breaking news (no investigations until we relaunch in late January 2017 unless you wish to do them). We require folks with a commitment to high journalistic standards, accuracy and ethical publishing. If you can help, please visit westpapuamedia.info/contact and get in touch with us. WPM needs your help as the current team is flat out developing secure tools, apps and training/tutorial resources to assist frontline and citizen journalists, with much of this needed before December 1, and of course our major work, Project FiveARM Secure Crisis Field Reporting Tool https://fivearm.isafemojo.press (we have been awarded a small grant by the Walkley Grants for Innovation in Journalism, but we cannot use any of that funding for WPM work). as well as site mirroring and anti-DDOS requirements that need to be paid for. As well as projected transition costs (that we will be crowdfunding for) for the new portal, which we are projecting to cost at least A$7000, plus the secure smartphone and camera support for our crew on the ground ($1500 per journalist per year). As we are still getting over 5-800 hits a day on archived articles, we know that WestPapuaMedia still proving very useful for researchers and for background investigations. But we rely entire on your support for survival, and even though you cannot see how hard we are working – you will see it shortly as we release testing and new tools and tutorials. If you can assist us achieving these goals, then your support will be greatly appreciated, and will enable safety support for frontline journalists to be developed much faster (we have significant costs in testing these tools). Donations are sorely needed at westpapuamedia.info/donate, where you can contribute via paypal (also directly via https://www.paypal.me/donate2WPMedia ), via bitcoin (Bitcoins are very much-needed for secure payments), or directly to our bank account (which also accepts Western Union payments if you are outside Australia). We hope to see your ongoing support. with much thanks and solidarity.